Professional Demolition International - These saws are made for walking but cutting they do too! By late 2018, Kern-Deudiam, based in Hövelhof, Germany, has produced and sold nearly 200 pieces of electrical floor saw KDF800-E featuring an 11kW motor. This very impressive for a mid-size company, with the accomplishment being the result of an extensive investment programme carried out by the German manufacturer in the recent years. On the back of this success, Kern-Deudiam has already enlarged its floor saw line with two new 7.5kW models, and is now planning to launch another one at bauma next year. According to the company, Kern-Deudiam electric floor saws are proving popular with contractors all over the world – from Europe to the Middle East to South America. This goes to show that the machines are capable of working efficiently in nearly all climate conditions. They perform equally well in Columbia with its extremely high humidity, or in the bone-dry climate of Qatar with outdoor temperatures of 50°C, or in the infamous Russian winters when temperatures often drop below minus 25°C. The MK-24 Series from US based MK Diamond Products are designed for high performance wet sawing applications. The reinforced steel construction, with balanced weight distribution and ergonomic handlebars, assures straight and accurate cutting and fatigue free operation. These mid-size self-propelled machines accommodate blades of up to 610mm in diameter with RPM of 2,100. The one piece box construction chassis made from hot rolled steel does not flex during operation, and is powder coated to resist peeling and corrosion. The 12 gauge steel hinged blade guard has a ‘right-on-the-blade’ water distribution system that supplies water to both sides of blade. 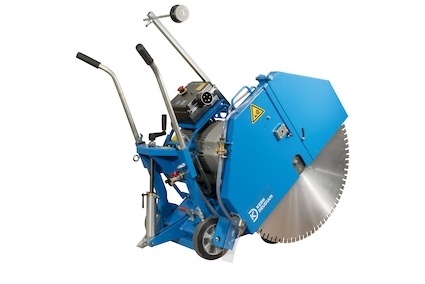 The blade guard mounts on both the left and right hand side of the saw, and cuts within 50mm of wall or curb. The machines feature a built in tach/hour meter and heavy duty hydrostatic transmission with variable speed drive. Hardwearing 150mm x 50mm non slip rubber wheels with maintenance free hubs and roller bearing are used for longevity. The forward and reverse travel speed is 0-24.5m per/minute. 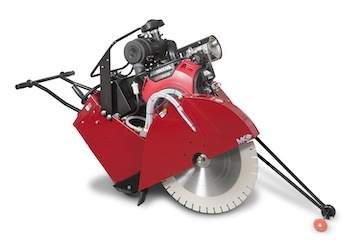 The MK-24 Series saws are available with two Honda gas engine options, GX630 V-twin or GX690 V-twin, and a propane model with a Kohler CH730 LPG engine. The fully automatic at sawing system from Netherlands based supplier Diacom is one of the most compact at saws available in the market today. Measuring 1,500mm x 600mm x1,100mm and weighing in at 360kg, the machine is powered by two small sized 7.5kW motors placed above the blade shaft for compactness and optimal weight distribution. Being fully automatic, the operator only needs to use joysticks and buttons to operate the saw. This year, the Dutch manufacturer upgraded the existing model with a frequency inverter. Thanks to this, operators now have the opportunity to choose the optimal rotational speed for different blade sizes ranging from 600mm to 1,200mm in diameter. Baier Tools, based in Stuttgart, Germany, has launched the BDN 511 - a hand-guided floor sawing and grinding system featuring 11 diamond blades. The machine is designed for effective removal of concrete of up to 45mm deep, and up to 50mm wide. Both width and depth are variable. The BDN 511 does not require any water, and ensures dust-free operation thanks to the OSHA-approved BSS 606L vacuum cleaner. The operation cost is €0.2 per running meter. 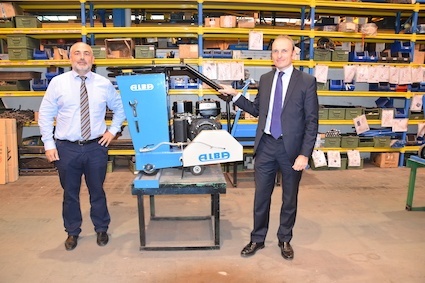 Alba, a construction machinery manufacturer from the Basque country, has extended its floor sawing range with the addition of the CJP500 ‘compact’ model. Accommodating diamond blades of up to 500mm in diameter, the new machine is an update of the proven CJP500. The operator controls the cutting depth via a fine tuned wheel and a depth indicator screen. A robust folding handlebar allows easy transportation in any commercially available minivan. A conventional plastic 30l tank is installed to supply the cooling water to the saw head protected by a rugged metal frame. The floor saw is powered by a Honda 13CV motor protected on all sides by a rigid metal structure. Further safety features include an emergency stop button and a stop position brake pedal. Founded in 1972, Spanish based Techno ex specialises in making light construction equipment for general applications. All machines, including floor saws, are manufactured at the company’s 4,000m2 facility in Mollet del Vallès, some 20km from Barcelona. Techno ex’s flagship model CA-500 features a heavy duty jig welded frame, self-aligning pillow block bearings, adjustable line guide, cutting depth indicator, a 40l water tank and a lifting hook for transportation. Powered by a 13HP Honda engine, the 135kg floor saw accommodates blades of between 350mm to 500mm in diameter, pro- viding a cutting depth of 100mm to185mm. Search Professional Demolition International - These saws are made for walking but cutting they do too!